The project achieved one more important accomplishment. The second Junior Code Academy scientific paper was approved and published. In addition to positive feedback from the project audience at dissemination and training events, the peers are now positively evaluating the results achieved by the project. 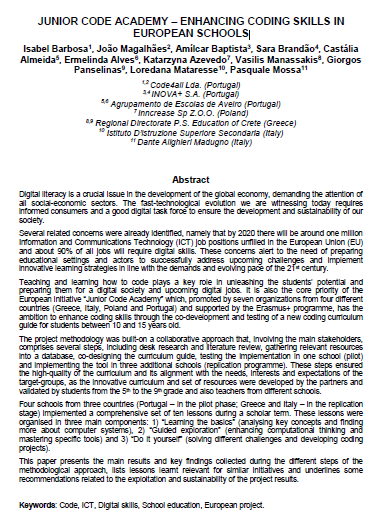 This publication is entitled “JUNIOR CODE ACADEMY – ENHANCING CODING SKILLS IN EUROPEAN SCHOOLS” and presented at the International Conference of Education, Research and Innovation – Seville 2017.